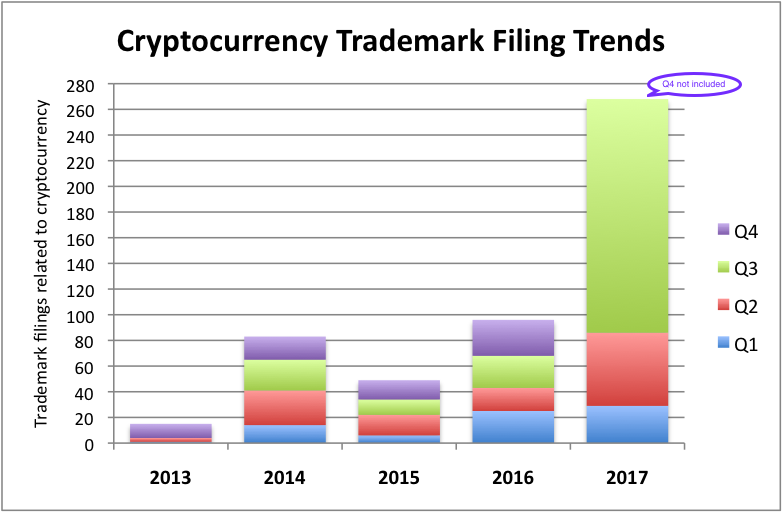 Here’s a quick view of the increase over the past few years in the use of cryptocurrency terms found within the goods and services descriptions of US trademark filings. 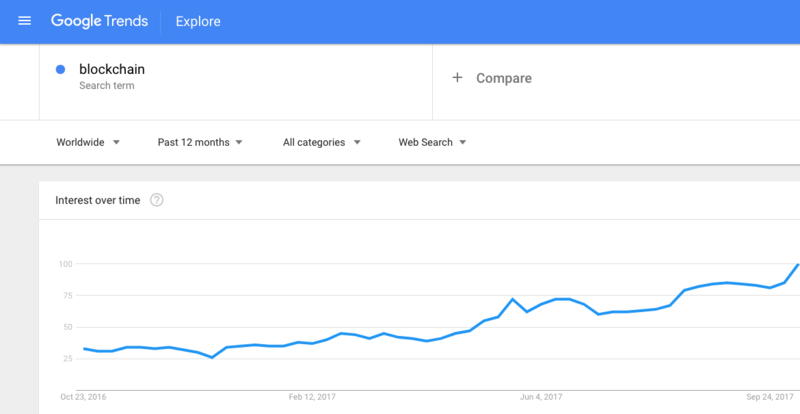 Specifically, we searched for the use of terms such as Bitcoin, Blockchain and Cryptocurrency. As can be seen, there has been a significant uptick in filings, especially in the third quarter of 2017. Note that Q4-2017 data is not included. Some of the top filers include: GENIUSES AT WORK CORPORATION, BLOCKCHAIN GOC, R-STOR INC., VIDROLL LLC, RIVETZ CORP. , CENTRA TECH, INC., and TATS LABS, LLC. 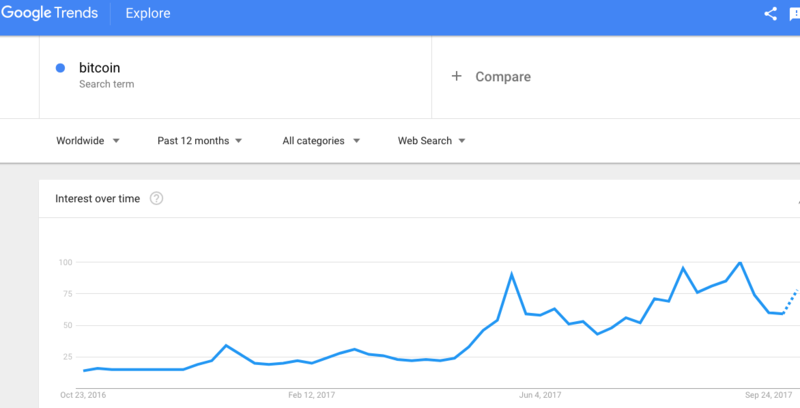 Below are tracks of the frequency of the terms Bitcoin and Blockchain, as from Google Trends. Here are comparative growth charts of some Fintech Startups, identified by PrivCo as IPO candidates in 2017. IPqwery charted their overall IP filings (patents plus trademarks) and funding rounds. For our sample, we chose 4 companies that had a similar number of total IP filings, although the relative number of patents vs trademarks are varied within the group. One additional company (boku) was included as an outlier, having many more filings than the others (the vast majority of them being patents). Not surprisingly, overall there seems to be a positive relationship between funding and filing activity. Generally, the rate of IP filing increases in close proximity to funding rounds, whether for patents or trademarks. Perhaps naturally, securing IP for any startup may bode well for investors. In a head to head comparison, IPqwery presents the IP holdings of Twitter and Snapchat. True, may not be a comparison of equals, but an interesting one nonetheless. Note: Aggregating this data is not trivial. There are many data manipulations required to accurately compile the IP profile for any company. This includes normalizing company names, verifying subsidiary companies and grouping related entities, and even match inventors with their respective companies. To investigate how this works in more detail, check out the IPqwery Chrome extension for Crunchbase and test it out yourself. What IP is found within Crunchbase’s Unicorn Leaderboard? IPqwery? has produced a nice overview of the intellectual property held by companies within Crunchbase’s Unicorn Leaderboard. Note: Aggregating this data is not trivial. There are many data manipulations required to accurately compile the IP profile for any company, Unicorn or otherwise. This includes normalizing company names, verifying subsidiary companies and grouping related entities, and even match inventors with their respective companies. To investigate how this works in more detail, check out the IPqwery? Chrome extension and test it out yourself on Crunchbase. As others have duly noted (Maurice Ross, David Oxenford) the NFL is zealous in its enforcement over what it deems unauthorized use or infringement of its Super Bowl trademarks. To give added context to this thread, which naturally surfaces at this time of year due to the hype associated with the event itself, we’ve listed all citations of the NFL’s marks over the past five years in the table below, to gain insight into what obstacles applicants face with respect to potential blocking marks owned by the league. 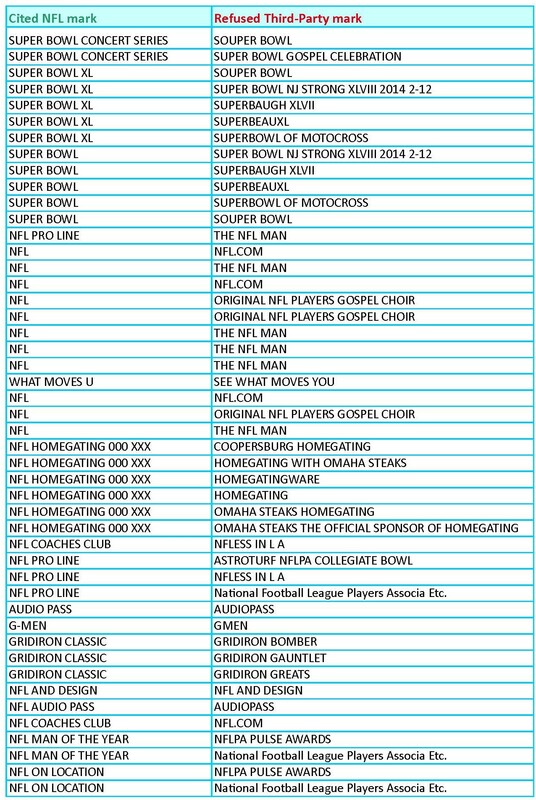 To what extent are Super Bowl trademarks being blitzed? 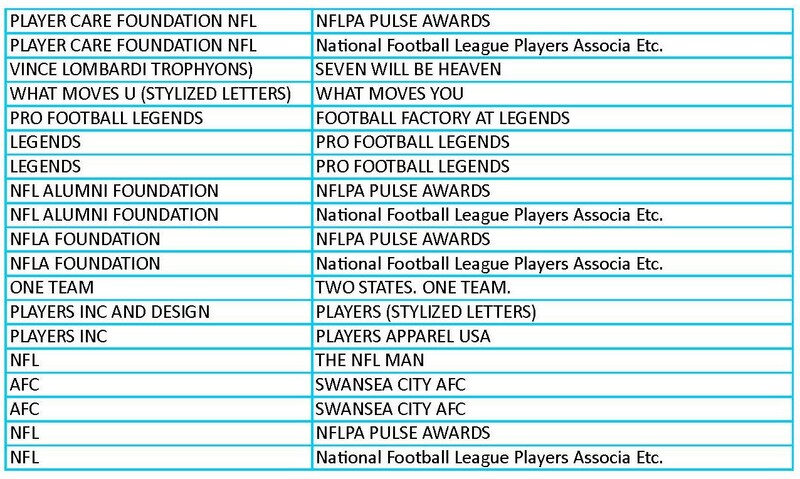 What’s immediately striking is that only 12 citations (listed at the top of the table) refer specifically to Super Bowl trademarks. The vast majority of NFL marks cited have no specific relation to the big game. 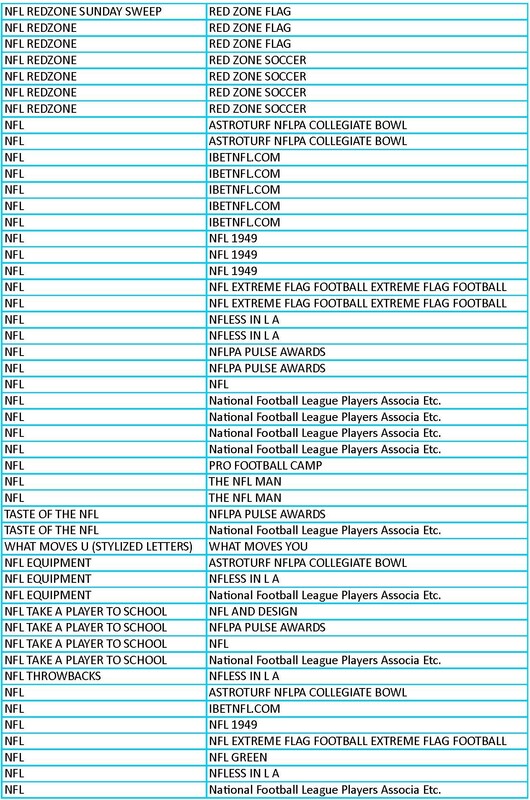 Given the press the NFL has received over the years regarding its offensive Super Bowl stance, at least from the trademark application perspective the hype does seem overblown. This is not to say that the league’s enforcement activities are unwarranted. Infringement and unauthorized use can be prevalent within the market, nonetheless. But in looking at this list of refused applications, one can’t help but be unimpressed by the foolishness exhibited by some of these applicants. What were they thinking? Still, there are also some instances where at first glance it seems the examiner was a bit overzealous as well (how about Red Zone Soccer?) We haven’t tracked outcomes, so it’s premature to comment further, but just because these were initially refused doesn’t mean the game ended there. It’s evident from this analysis (and generally from what we see weekly in our 2(d) Citation Watch) that USPTO examiners provide good defensive zone coverage for all mark owners, not just the NFL. So while it may be true that the NFL is itself aggressive in enforcing trademarks rights within its gridiron, the USPTO is also no slouch when it comes to making sure applicants don’t impinge the trademark rights of others. 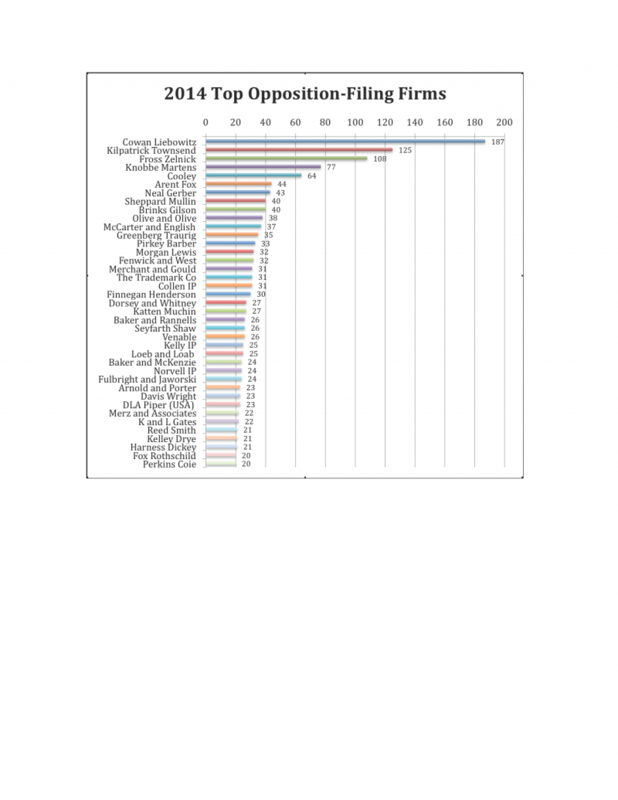 Which Firms Filed the Most Oppositions in 2015 (& 2014)? Back again is Towergate’s compilation of Top Opposing Firms, based upon the correspondent at filing of all oppositions in 2015. Compared to previous years, there are a number of change-ups in the lineup, and firms not previously noted in our list of years past. Kudos to all! 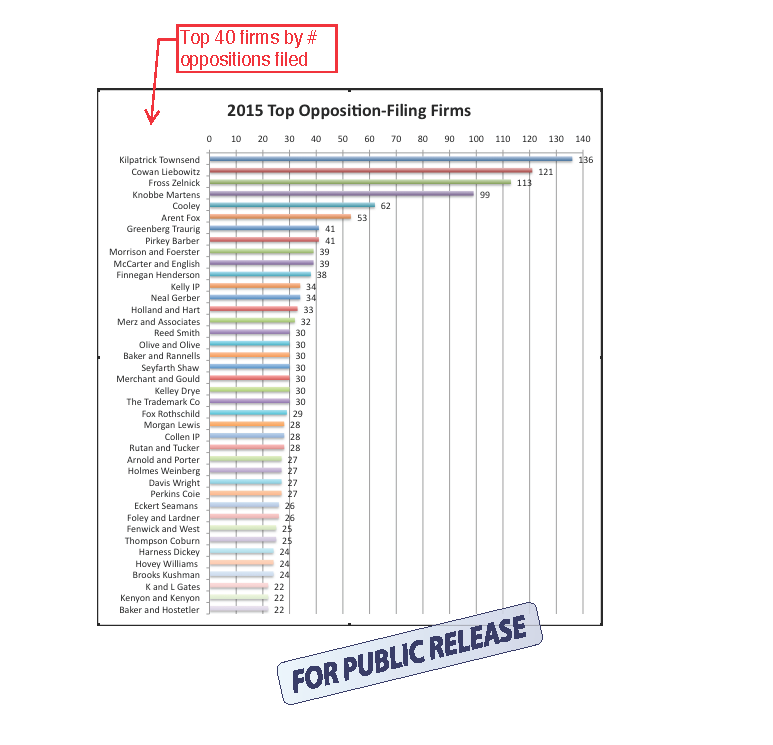 For the first time, we are showing just the relative rankings of the top 40 opposition-filing firms, without further details given of each of their oppositions. If you’d like further details, please contact us. One of the most significant changes to note is that the firm Cowan Liebowitz and Latman slipped to second rank, after many years of being the top opposing firm (thanks to MLB). Compared to 2014 and years prior, the firm’s numbers have dropped substantially whilst those of Kilpatick Townsend and Stockton have increased. Kilpatrick’s oppositions have been mainly fueled by owners Instagram, Oracle, and Occulus VR. 2(d) Citations, refusals, and opposition filings are good benchmarks of your firm’s performance relative to other firms within the industry. Subscribe to our popular 2(d) Citation Watch or Bulk TM Watch services and watch your IP practice grow! Here’s a comparison chart of Top Opposing Firms in 2014. I’m partial to conundrums, I admit. 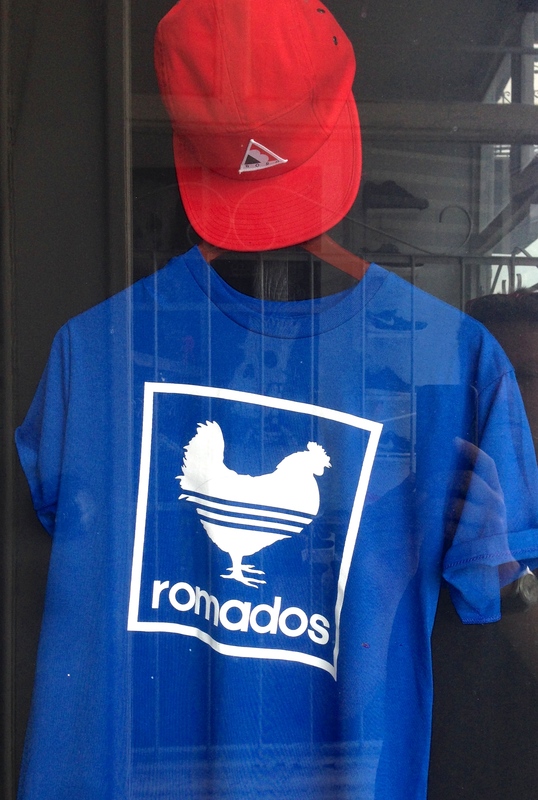 Which makes this find doubly interesting, as on the surface it looks like a clever and playful take on retail fashion branding and trademarks. Perhaps there is more to it than that? According to the meagre publicity I was able to find, the concept here was to offer a counter culture aesthetic/style to a young and urban male generation; one that elicits strong reactions. 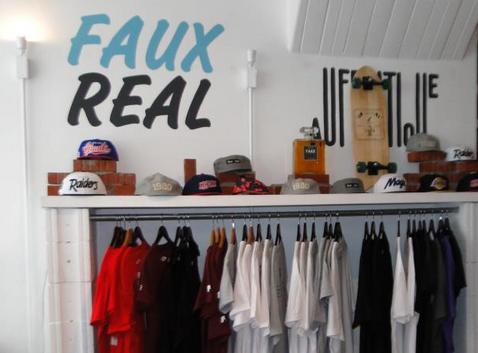 Many of their clothing products are satirical knockoffs that mock a variety of luxe brands. 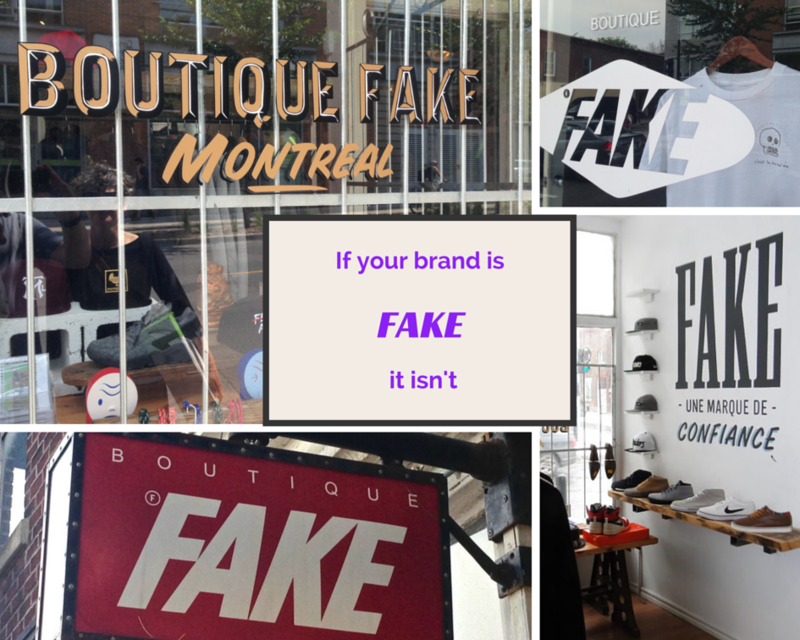 There are signs that denote FAKE is “faux real” and a “marque de confiance” (a trusted brand). It’s very creative, to be sure. Subversive, even. What you also need to know is that the entire concept and reality of the establishment has been backed to some degree by a mysterious group called The Medium, a self titled multi-media artist collective. 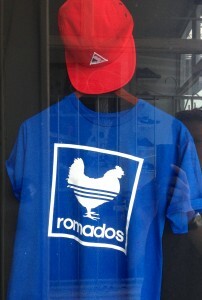 OK, so they’ve got loads of veritable street cred. But below the surface one realizes that, at some point, the FAKE counter-brand is the brand itself. It has realized the purposefulness of its existence, and come full circle. Subversion, that itself has been subverted (perhaps by its own success). It’s a slippery slope. That’s the conundrum. Is it therefore, still subversive? In any case, FAKE is fun, and ironically it’s brand centric, despite its best intentions. I can’t help but be humming the Circle Game song (the original, of course). A nice shout out to Towergate for the trademark opposition data we provided in this tech article by Benny Evangelista about the CrowdX platform from Coveroo. …baseball files far more federal trademark protests than any other sport, according to Towergate Informatics, a company that tracks trademark-related data for the intellectual property industry. Towergate said MLB and its teams filed nearly 170 protests in 2013, while the NBA and NHL combined filed just 28.